Coenzyme vitamin B12 in the form of adenosylcobalamin is the active form of vitamin B12 used by the mitochondria, the energy centre of each cell. This involvement in the ATP/Krebbs cycle has a positive effect on fatigue, making adenosylcobalamin a useful energy booster in addition to achieving the benefits of Vitamin B12 supplements generally. Without this active form of B12, the human body would cease to produce energy at the cellular level. This would terminate all cellular processes and result in eventual systemic failure. The European Journal of Clinical Nutrition concluded that the best way to address a B12 deficiency is the combination of the active forms methylcobalamin and adenosylcobalamin. The active coenzyme forms of B12, methylcobalamin and adenosylcobalamin bypass usual mechanisms of absorption that rely on intrinsic factor and the combination is effective in addressing both the neurological and haematopoietic pathways. Methylcobalamin is found in the cytosol of cells and interacts with an enzyme called methionine synthase; a critical enzyme involved in DNA synthesis and may be particularly useful for individuals with impaired methylation capacity. Adenosylcobalamin is the mitochondrial form of the B12 vitamin found in cellular tissues and interacts with an enzyme called methylmalonyl CoA mutase, a metabolic enzyme, and may be useful for those with impaired energy production. Methylcobalamin and adenosylcobalamin have different functions thus providing a total solution for those with B12 deficiency. We suggest at least one 5mg lozenge of methylcolbalamin with adenosylcobalamin at least once daily. Some may need to take multiple doses daily. For those with a serious health problem (barring detoxification/adaptation issues ) at least 3 doses daily are suggested. Even at these high doses, depending on the individual's health profile, one must expect it to take months to begin to resolve a serious/long term condition. If resolution occurs more quickly, then that is a bonus. This product is offered at a very special price for our non-USA customers. You will see here, it is being offered by Amazon at £44.02 with shipping (at the time of writing) for the exact same product. The body relies on the efficient conversion of carbohydrates and fatty acids to glucose, the body's fuel. Vitamin B12 plays a major role in that conversion. The older one gets the more likely a vitamin B12 deficiency becomes. Vitamin B12 deficiency comes about from either not getting enough in your diet and/or from losing the ability to absorb it. Other ingredients: sorbitol, mannitol, natural cherry flavor, stearic acid, and magnesium stearate. Suitable for vegetarians and HYPOALLERGENIC: Contains no yeast, dairy, egg, gluten, corn, soy, or wheat. Contains no sugar, starch, salt, preservatives or artificial color, flavor or fragrance. General maintenance use: one lozenge daily dissolved in the mouth. Place tablet under the tongue and allow to dissolve slowly, altering its position to avoid prolonged contact with the same area. Intensive use: up to 3 lozenges daily, dissolved in the mouth as above, or as recommended by a healthcare practitioner. Caution: If you are pregnant, may become pregnant, or breastfeeding, consult your health care professional before using these products. Vitamin B12 deficiency is more common than previously thought, not limited to vegetarians who were previously seen as the "primary" group suffering from this deficiency. It is common also in the over-60s (as high as 25% of this group). Furthermore, evidence is now emerging that other age groups may also have a deficiency. When blood levels of vitamin B12 are low, one or more of these processes may be affected. Without adequate B12, one can experience symptoms related to low energy, mental fatigue, mood changes, sleep difficulties, and even occasional indigestion. As one ages the digestive system deteriorates (especially with a western diet). The lining of the stomach loses its ability to produce hydrochloric acid which releases vitamin B 12 from your food. The use of antacids or anti ulcer drugs will also lower your stomach acid secretion and decrease your ability to absorb vitamin B12. Infection with Helicobactor pylori, a common contributor to stomach ulcers, can also result in vitamin B12 deficiency. However the main cause of vitamin B12 deficiency is a term researchers call "food-cobalamin malabsorption syndrome". Cobalamin is the scientific term for vitamin B12. This typically results when the stomach lining loses the ability to produce the protein that binds to vitamin B12 and allows your body to absorb it at the end of your small intestine. Overloaded with food colorings and preservatives. Add to this the harmful effects of caffeine, pollution, conventional therapies, and the stress most people experience every day. Many people avoid red meats for a large variety of reasons. However, this puts one at a high risk for developing vitamin B12 deficiency, because plant sources have virtually no vitamin B12 and most oral (non-sublingual) forms of B12 in nearly all supplements are practically useless, as little is absorbed into your bloodstream. Vegetarians should take this essential micronutrient to ensure an adequate supply of it, because it is found almost exclusively in animal tissues. The few plant foods that are sources of B12 are actually B12 analogs, not the form that provides all the benefits of the real deal. A B12 analog is a substance that blocks the uptake of true B12, the result being, the body's need for the nutrient actually increases. If you suffer from sleeping difficulties, daytime B12 supplementation may help. B12 plays a vital role in melatonin production. Melatonin has been called "the sleep hormone" because it is responsible for letting you get a good night's sleep. As one ages, it becomes increasingly more difficult to get a good night's sleep because the body becomes less efficient at making this hormone. Sometimes even those who eat foods rich in B12 may need to supplement. Even if one eats plenty of meat, poultry, lamb's liver, brewer's yeast, clams, eggs, herring, mackerel, kidneys, milk, dairy products, seafood etc low levels of B12 may still prevail. This is possibly because the body is unable to absorb it from the gut. Vitamin B12 needs the help of a protein in order to be absorbed. That protein is called intrinsic factor. And because the lining of your stomach makes intrinsic factor, people with less-than-optimal gastrointestinal health often need to supplement with B12. Likewise, most people over the age of 50 have a limited ability to absorb B12 too, thus, the need for supplementation. 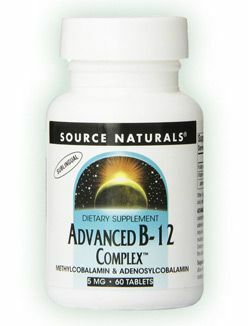 Sublingual B12 is preferred as evidence indicates that most of the vitamin goes via the lymphatic system. Therefore, this treatment mode may yield more benefit by avoiding the digestive system. Methylcobalamin is the form of vitamin B12 active in the central nervous system. It is essential for cell growth and replication. In some people the liver may not convert cyanocobalamin, the common supplemental form of vitamin B12, into adequate amounts of methylcobalamin needed for proper neuronal functioning. Methylcobalamin may exert its neuroprotective effects through enhanced methylation, acceleration of nerve cell growth, or its ability to maintain already healthy homocysteine levels. For methylcobalamin to be available to the brain, it should be allowed to dissolve in the mouth. High-dose sublingual Vitamin B12 has been found, in many cases, to help relieve Alzheimer's disease, multiple sclerosis, bi-polar disorder (especially depression), phychotic depression, violent behaviour, paraniod psychosis, asthma, allergies, low immunity and chronic fatigue. Vitamin B12 in the form of Methylcolbalamin is non-toxic and crosses the blood-brain barrier and is therefore especially beneficial in brain and neurological disorders. Please click here to read the Townsend Letter for Doctors and Patients, May 2006 by Joseph G. Hattersley about the use of high dose Vitamin B12 for the reversal and prevention of Alzheimer's Disease and other diseases. Vitamin B12 What is the Ideal Dose ? The danger of not taking high enough dosages - The case for classifying vitamin B12 as an essential supplement to try, for all of those with less than perfect health. Conditions ranging from low energy, poor concentration, mental and emotional insecurity all the way through to chronic disease (be it hormonal, autoimmune, circulatory, brain or nervous system) may respond well. Vitamin B12 has such a wide range of function in our physiology. It certainly is essential for health and even life itself. B12 has possibly the most complex and multi-staged route to absorption, conversion and finally assimilation into the cells, and this process often does not work properly resulting in deficiency. So it is not just a question of vegans becoming deficient, the majority of those who respond to B12 supplementation are meat, egg and fish eaters (so encompassing the main dietary sources of B12). B12 has several forms and conversion stages in the body. An example is Methycolbalamin; crucial for brain cell and nerve function and indeed ultimately survival. Another example is Adenosylcobalamin which is more involved in supporting the Krebs cycle (i.e. the production of ATP) for 80% of the bodies energy, oxygen utilisation and immune system health. B12 is also involved in protecting the blood from derangements that can lead to clot forming, and hence cardiac arrest (i.e. heart attack and stroke via its action on reducing homocysteine levels). High homocystein levels also contribute to arterial plaque that will stiffen the blood vessels and narrow them, further increasing the risk of strokes and heart attacks. Folic acid is one of the nutrients that converts homoysteine to a beneficial chemical, but cannot do its job properly without vitamin B12. Mainstream/out of date medical practitioners only recognise B12 deficiency in relation to Pernicious anaemia and rely on the misleading Plasma B12 test. The established level for deficiency is also set too high. Certainly sub-clinical and long term effects of B12 deficiency are not taught to General Practitioners. B12 was always known to be poorly absorbed if swallowed and some people would not respond at all to oral B12; therefore subcutaneous injections have traditionally been the favoured method of administration. However, with the arrival of sublingual lozenges that infuse some of the B12 directly into the bloodstream and also the use of the methylcolbalamin form of B12 within those lozenges that has been demonstrated to be far more efficiently absorbed and utilised, the need for injections has all but been eliminated. Some people who have long term B12 deficiency can take months to fully respond to B12 supplementation, so unless they are aware of this and the time for symptom improvement is kept as short as possible many will give up taking the B12 before it has been been able to noticeably help the sufferer. The time taken to relieve symptoms can be reduced by taking high dose methylcolbalamin and/or adenosylcobalamin. These substances are non-toxic even at what would be considered high doses. 5 g has been administered in a clinical setting to treat cyanide poisoning. A 5 mg tablet is just 1,000th of that dose. Any excess methylcolbalamin and/or adenosylcobalamin for the daily needs will either be stored in the liver to top up the depleted reservoir or be eliminated from the body. For those with long term issues such as psychiatric or mood disorders and also anyone suffering from neurological damage disorders of all kinds such as Parkinson's, Alzheimer's, Multiple Sclerosis, Motor Neurone disease etc. the need for high doses is especially urgent, in order to obtain some remission from their condition. Page 216-219 of the recommended book; Could it Be B12 ? An Epidemic of Misdiagnosis by Sally M. Pacholok R.N BSN Jeffrey J. Stuart D.O. details why testing is unreliable and suggests that clinical signs and symptoms should be the leading guide; this assesment is called the cobalamin deficiency risk score (CDR). We have now permanently discontinued LEF 1mg Vitamin B12 60 Lozenges. 1/ The standard 'state sponsored' Doctor is not normally in the know concerning the vast array of conditions that are engendered by B12 deficiency. Usually they only relate pernicious anaemia to B12 deficiency. 2/ The definition of deficiency is set at a level that is too high. A high proportion of sufferers of B12 deficiency who respond well to B12 supplementation show a B12 blood plasma level of B12 that state sponsored doctors consider within normal range. 3/ Many who have B12 deficiency and have their conditions improved or completely resolved with B12 supplementation show adequate B12 levels in the blood plasma even by the more realistic criteria. This is due to the fact B12 has to be further metabolised and integrated into the cells. Failure to accomplish this is one of the common reasons for what we should call cellular B12 deficiency. 4/ A more reliable test is known as The Methylmalonic Acid test. This can be taken from the blood or more reliably from a urine sample. This test indicates if the body lacks B12 at the cellular level. However this test suffers from shortfalls. 1/ There is an error rate of about 20 %. This may be because just one sample is taken. If it could be taken daily for a period it would give a more reliable indication . Currently it costs around $200 per test (home test-urine sample sent to lab). So bearing all this in mind, it is felt that vitamin B12 in the form of methylcolbalamin and adenosylcobalamin should be considered an essential supplement for all those who do not have radiant health. For those who have scored above 3 in the questionnaire higher doses are expedient. For those with neurological disorders or chronic illness even higher doses are suggested at level of at least 10 mg daily. The extreme results of prolonged vitamin B12 deficiency are brain damage and death, however death can also occur from heart attack or stroke due to B12 deficiency.